This is the first time in almost a century that a total eclipse will traverse the fruited plains from coast to coast. One of the most beautiful sights associated with a total solar eclipse is the "diamond ring." 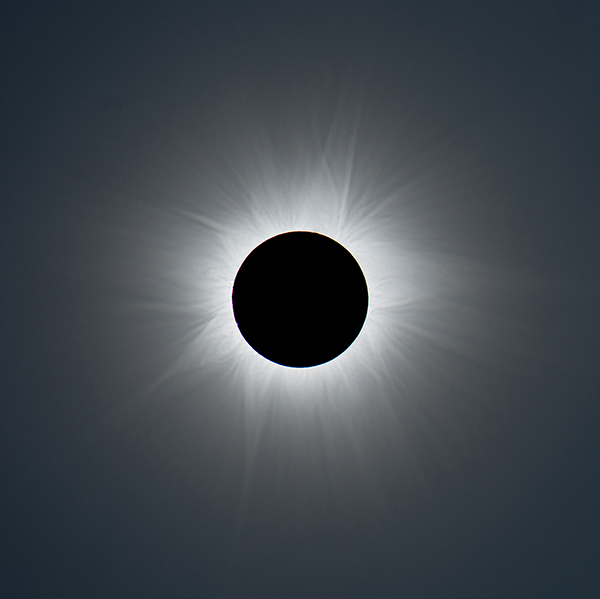 It appears just before the beginning of totality, when a single bright point of sunlight — the diamond — shines through a deep valley on the Moon's limb (edge) and the inner corona — the ring — becomes visible. Do you plan to see the total solar eclipse on August 21? No? What? Are you ill, or trapped in a dungeon? C’mon. This is the first time in almost a century that a total eclipse will traverse the fruited plains from coast to coast. You’ve got to see it if you can! Thousands of people from around the globe will come to the US to catch the eclipse. If you live in one of the lower forty-eight states of the US, though, you can catch an eclipse without showing anyone your passport. The last total solar eclipse seen anywhere in the continental US was February 1979. It appeared as a partial eclipse in my hometown of Amarillo, Texas. I remember the day for one reason: My mom had the good sense to spring me from school and drive me to the local planetarium. From there, I could watch the event through special filtered glasses. To me, it looked like the Moon had taken a bite out of the Sun. Except no Moon was visible: just the bite and the Sun. Maybe you’ve seen a partial eclipse, and thought, “No big deal.” I get that. The bright part of the Sun, called the photosphere, is so bright that even if half of it gets covered by the Moon, it’s hard to tell the difference. To the naked eye — without special glasses or other methods to view or project the eclipse — it just looks like the sky has gotten a bit cloudy. You’ve probably also seen a lunar eclipse — when the Earth passes between the Sun and Moon, and the Moon turns red. Those are cool, but aren’t all that rare or exciting. Here’s the thing: A total solar eclipse is nothing like a partial eclipse or a lunar eclipse. In a total solar eclipse, just before “totality,” the last bright bit of the Sun’s photosphere looks like the pink diamond of a cosmic engagement ring. When the Moon covers the Sun’s disk, the sky goes dark. The temperature drops. The stars appear. Critters get confused and go quiet. And the dim outer atmosphere of the sun, the corona, reaches out from the black lunar disk like the arms of an enveloping ghost. 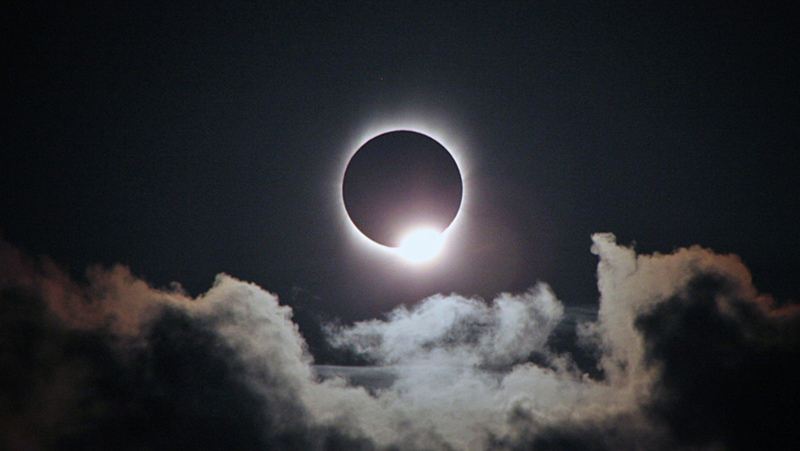 The total phase of the November 13, 2012, solar eclipse as seen from Australia. This is a composite of short, medium, and long exposures. If you see this, you will remember it. During a total eclipse, simple villagers and skeptical scientists are overcome with awe in equal measure. People cry and cheer and gasp and pray. The mechanics are simple. A solar eclipse happens when the Moon, Sun, and Earth line up in a straight line. The Moon passes in front of the Sun. If you happen to be in the path of the Moon’s shadow, and it’s not cloudy, you’ll see an eclipse. Those fully in the Moon’s shadow (the umbra), will see the Moon cover the Sun. If you’re just outside that path, you’ll see a partial eclipse (the penumbra). My family and I will be in Columbia, South Carolina, where the Sun will go black at 2:43 PM eastern time. If it’s cloudy, we’ll be in a mad dash to the closest spot with clear sky. 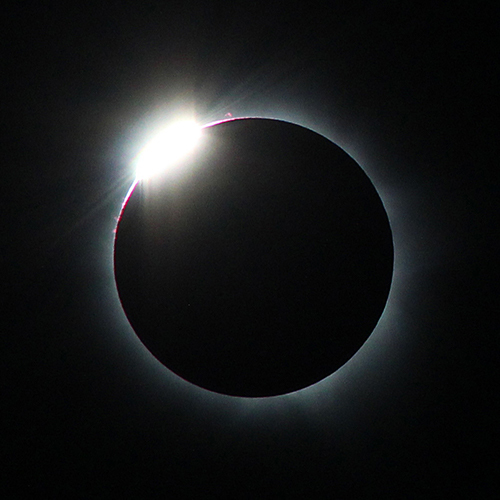 The “diamond ring,” which appears just before the beginning of totality. See the maps and times about it here, here, and here. If you want to make the event a learning experience, NASA has made it easy with a terrific website and even an app. Much of the US population in the lower forty-eight states is just a few hours’ drive to a sweet spot. So, it’s not too late to plan a trip — though it may be too late to find a hotel room. Don’t forget to buy the special glasses to protect your eyes. Even when the Sun is almost covered, its light could still fry your rods and cones. Check out this guide on how to view an eclipse safely. If you aren’t in the Moon’s central shadow at the right time and place, you can still see a partial eclipse in the mainland United States. The closer you are to the path of totality, the more you’ll see. It’s worth getting the special glasses so you can view it, but it won’t be nearly as dramatic outside the Moon’s central shadow. It won’t be dark. If you’re anywhere near the path of totality on August 21, though, don’t miss out. Trust me. Have you noticed the odd coincidence? The Moon and the Sun aren’t much alike. Yes, they’re spherical. But one is a giant ball of gas and plasma. The other is a much smaller rock. And yet, during a total eclipse, they mark off the same space in our sky. They match. That’s because the Sun is about four hundred times larger than our Moon, but also about four hundred times farther away. Eerie huh? Is that nice fit just a coincidence? Or is there something more to it? I’ll answer that in the next installment. Jay Richards is the Executive Editor of The Stream, and co-author of The Privileged Planet. Follow him on Twitter. Best of all, it’s not a harbinger of doom! It has nothing to do with “prophecy”! It’s an interesting shadow, but it has no supernatural significance! Will you try to unpack the apparent tension between Gen 1:14 and Matt 2:2 vs Isaiah 47:13-15 and Deut 18:9-14? Astrology and divination is generally condemned but then Christians regularly celebrate the account of the Magi following the star and Genesis says the lights in the sky will also serve as signs. It’s roughly the same as the difference between a prophet and a false prophet, in that they may sound similar, but one is of God and the other isn’t. Who would you consider a prophet of God who uses celestial signs? Who is this goodness to whom you give thanks? Saw the 1970 eclipse. Still remember how surreal it was, despite understanding the simplicity of it. I remember the 1970 eclipse. I was in fifth grade. Even when the Sun is only partially eclipsed, the quality of the light becomes quite strange. I’ll be in my hometown, St. Louis, Missouri. I was doing what you might call embryonic research into triple primes (the product of three consecutive prime numbers), and their occurrence in nature. The first matches with the distance from the earth to the moon (in earth diameters), the second with the angle of the atoms in a molecule of water, and the third is a close match with the sun-moon ratio. Thanks, Jay. Your comment, “A total solar eclipse is nothing like a partial eclipse” of the sun is right on the mark. An eclipse of the moon is a dark shadow (pun intended) by comparison. We’ll only get the 92% partial as we’ll be in Seattle that day & flying back to our new Phoenix home later in the day; we’re missing it due to inadequate planning. My only excuse is that I’ve already seen two total solar eclipses, the first was a few minutes after sunrise on June 30, 1954, about 150 yards from my boyhood home in Yankton SD. Fortunately, this site was on the top of a bluff overlooking the Missouri River and Nebraska. I was 13 and younger brother Tom was 11; think how enthusiastic I must have been to encourage an 11 year old to voluntarily get up before dawn, around 4 AM! The sky was wondrously clear. Strange waves of light passed over Nebraska from our perch at totality. I’m so pleased you’re making the pilgrimage to observe this wonder!